Looking Ahead: Exiting Your Business (25 minutes) prepares business owners for stakeholder exit with insights into the endgame scenarios of IPO, merger and acquisition, and liquidation. In Looking Ahead: Exiting Your Business (25 minutes) the business owner endgame scenario is explored for possible solutions to this age old problem. While there is much focus on entrepreneurial scheme giving life to new businesses, little is discussed about how to exit an organization once business is underway. Marketing the exit to potential investors is one of the most common scenarios found in the business environment. 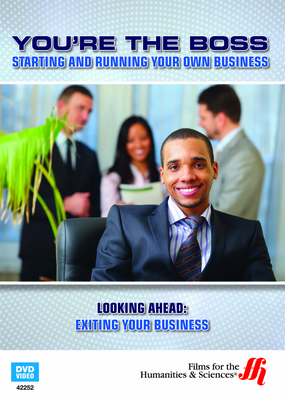 By pre-planning an exit strategy, business owners can greatly reduce risk, while gaining more in profits. The video provides a brief overview of the merger and acquisition context, as well as the terms to sale of business owner interest in a case study of the end-game scenario. An important long-term objective for any entrepreneur looking to cash out on their great idea, Looking Ahead places emphasis on the exit strategy as the taken for granted result of a job well done. For those thinking ahead about selling a business, this short film is a must. Viewers are introduced to the early endgame scenario of growth through issuance and listing of a company on the stock market through an initial public offering (IPO) of shares. Marketing of the sale of the company to investors for merger and acquisition is also examined, the benefits and risks to continued participation as a limited stakeholder. Last ditch liquidation as a final endgame scenario, concludes the exploration of the topic, focusing on the requisite maintenance of account records to business assets.